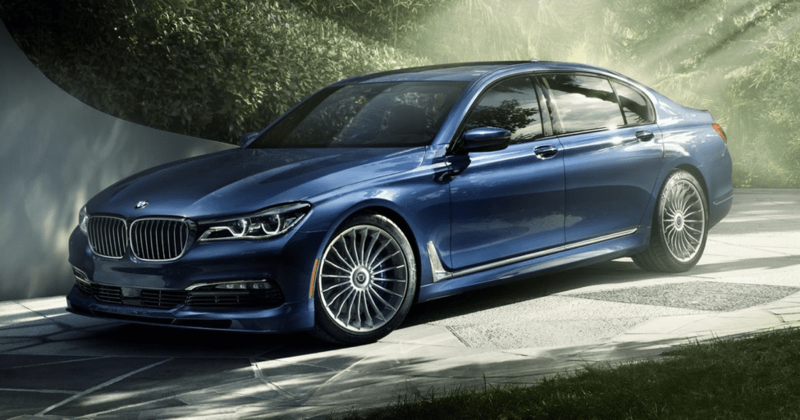 Among the entire BMW 7 Series, the 2018 Alpina B7 stands out from the family with its distinctive exterior curves and signature Alpina blue metallic color. The family-owned Alpina company has been in business since 1965 and works exclusively with BMW to enhance existing models with both luxury features and sporty performance. Producing less than 2,000 cars a year, Alpina pays significant attention to every detail like a bespoke carmaker would. The B7 model is not only more luxurious than the regular 7 Series, but is also more responsive and better at handling curves. The four door was introduced for the first time last year in Geneva and proves to be a top rival to other carmakers. The classic 20-spoke aluminum wheels are eye catching whether on back roads or at a top speed of 193 mph on the highway. Alpina modified BMW’s 4.4-liter V-8 engine with its own custom twin turbochargers. The turbochargers push the B7’s horsepower to 600 and the torque to 590 ft lbs. Racetrack inspired, the disguised sport car’s carbon core frame holds a balance of weightlessness while delivering surprising strength. Capable of speeding to 60 mph in just 3.6 seconds, the B7 is excellent at changing lanes in heavy traffic. As if the exterior wasn’t enough, the Alpina B7 defines luxury on the inside. Buyers can pick from 12 leather upholstery colors among several other details to create their own personal look. The steering wheel is covered in Lavalina leather and details green and blue hand-stitching, matching the blue digital display. The seats not only tilt and vibrate, but blow hot and cold air as well. Several luxury packages can be added during customization including an executive seating package which features rear foot rests, massage seats, and more. Additionally, the Panoramic Sky Lounge LED roof projects colored light on the overhead glass, creating a unique and luxurious look for all 7 Series. The Alpina B7 takes the already great 7 Series and adds exclusive features and details to make a one of a kind car that defines luxury. Pricing for the B7 starts at $137,000 but can easily be $20,000 more than that with add-ons.